Have a favorite song that you want to use to seed a new music station? Maybe you’re looking to find some new tunes to hear based on a particular song or artist? iTunes Radio makes this process simple, and you can instantly create a new iTunes Radio station from any playing song or artist, whether that song is in your music library or playing from an existing iTunes Radio station. The latter situation is fairly well known by Radio users, but creating a new station from songs that already exist in an iTunes playlist is less well known. This works with any iTunes client that supports the Radio feature, whether it’s the desktop iTunes app or the Music app in iOS. iTunes Radio is currently region limited, but for users who are outside of the USA and other areas with Radio support, you can still listen to iTunes Radio with a US-based Apple ID. 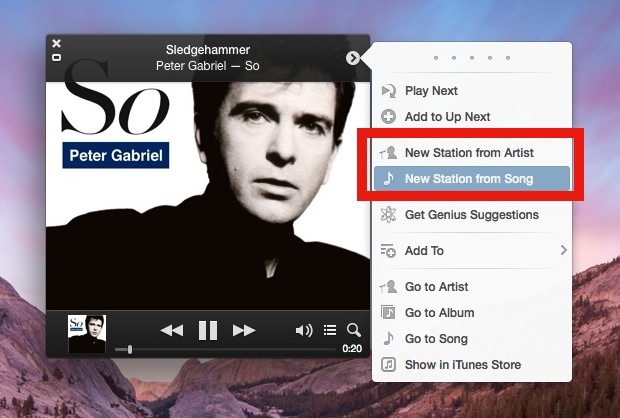 You can also access the New Station features from the iTunes Album Art player, as shown above, or with a Right-Click on any song name in the iTunes song playlist. Making a new radio station this way will immediately jump to the Radio portion of iTunes (or Music app), from there you can either tweak it to play towards discovering new music or just playing the hits, to allow or deny explicit lyrics and thus album versions of some songs, and the other usual adjustments. On the iOS side of things, you can access the same feature within the Music app on the iPhone, iPad, or iPod touch, by tapping on the (i) button as if you were to share a station but choose “New station from song” or “New station from artist” instead. 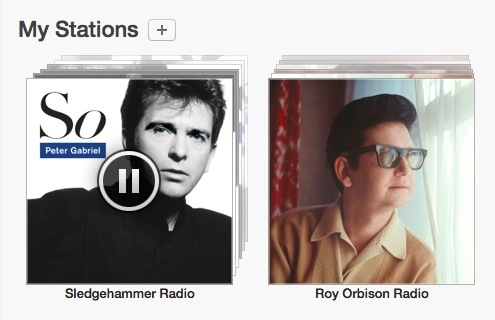 Enjoy your newly created iTunes station. This can be a really great way to find new music, particularly if you tweak the settings for “Discovery”, or if you just want to play some of the related genre classics, keep it on ‘Hits’, which is the default setting.